If you’ve come to this website you’re undoubtedly already aware of many of the reasons to caption and describe your video. 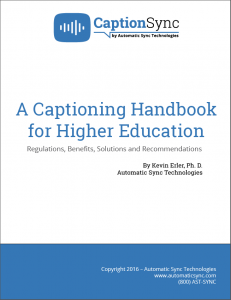 You may be captioning and describing for ADA, AODA or Section 508 compliance, or you may have one or more deaf students who have requested closed captions, or blind students who have requested audio description. We have assembled information about the main accessibility regulations related to video here. However, if you need more reasons (perhaps to justify the cost to your budget committee), read on. There are many significant “hidden” closed captioning benefits and audio description benefits that all organizations that produce video should be aware of. Improved Indexing and Searching: Use closed captions, transcripts, and descriptions as meta data to make your video text-searchable, and to make web-embedded video search engine friendly. Viewer Flexibility: With the increasing popularity of mobile devices, viewers may be in environments where access to the audio or video is limited. Closed captioning allows people to view content whether they are in the library, at a concert or on a noisy bus, and similarly audio description allows people to listen to content in podcast form while walking or driving. Improved Accessibility for ESL Viewers: There are more viewers with English as a second language than there are with English as a first language — closed captioning helps your message reach larger audiences. Improved Comprehension: Closed captioning improves comprehension and retention of media content for all viewers. Our research page describes this point in more detail. Details about closed captioning benefits are described in our latest whitepaper, available for free download here. Professors, students, and IT administrators share the benefits of using captions for videos in postsecondary education.